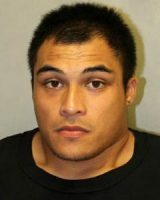 Chad G. K. Armitage Jr.
One man is in custody and another is in the hospital following an assault Monday (December 19) in Hilo. At 6:59 p.m. Monday, South Hilo Patrol officers responded to the 300 block of Kūkūau Street, where they found a 48-year-old Hilo man with serious injuries to his face and head. At 7:12 p.m., officers located the suspect, a 21-year-old acquaintance of the victim, nearby. Chad G. K. Armitage Jr. was arrested and taken to the Hilo police cellblock while detectives from the Area I Criminal Investigations Section continued the investigation. The victim was taken to Hilo Medical Center and later transferred to The Queen’s Medical Center on Oahu, where he remains in serious but stable condition. At 4:30 p.m. Tuesday (December 20), detectives charged Armitage with first-degree assault. His bail was set at $5,000. He was also processed on a $40,000 bench warrant for an unrelated Maui case. Armitage remained at the cellblock until his initial court appearance on Wednesday (December 21).